Been working on this off and on for a few days.. it is supposed to have a herringbone or chevron pattern up every other slice.. but I think I might just do it on the second slice in on both sides now that I've gotten this far. I love the white denim fabric.. very satisfying, heavy and solid but not so bad the sewing machine went gronk or the hand sewing needle was too tough to get through it. The black is hand-crocheted yarn that was then stitched into place with black thread. I saw the idea on Dan Do, the Welsh decorating show. Esme's bamboo (drachsena, really) plant needs to have a splitting... I've got her permission now I just have to get some distilled water and some courage. And my pretty little sewing bowl with all the pins and needles in it from working on the pillow. started trying to find a car etc.. all hell broke loose, mudslides and riots and eventually I was piloting a space ship that looked like a giant whale which I crashed because I couldn't get the tail to work right. 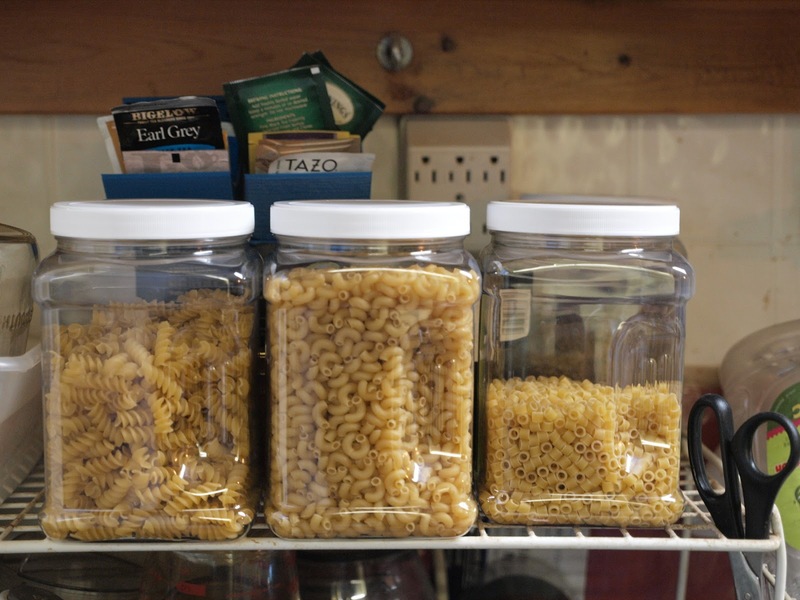 All of this pasta used to be in an upper cabinet which was hard for our chef-in-training to reach without climbing on cabinets. 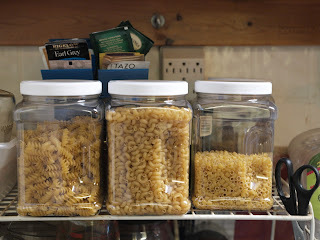 Now, we have made a 'dry goods center' starting with three kinds of pasta. And she can reach the colander, can opener and pans. So, we are learning to make pasta sauce and pasta - to eventually be made all on her own. Finished the Octopus Vomit blanket, which kind of doubles as a shawl.. depending on if you're reading on the bed and want to cover your knees or your shoulders. It is warm. The colors worked together as best as possible .. but the grey yarn (flea market find, two HUGE balls of it).. was really atrocious by itself. So I went with the all out bright red (inspired by Esme's octopus toy, seen here) and threw in some other stash white and yellow bits to give it a logical pattern. Happy Valentine's Day. I gave Esme a little beanie baby red raccoon.. which she liked. I have to go for my eye appointment soon - really need new glasses. And I was going to make some carrot coconut ginger soup later today. It's my only day off this week and I seem to have filled it UP... little goals sketched out on paper that I'd like to work on today. And just a bit of a complaint / rant... about Pinterest. I like Pinterest. I love scanning through the pictures of things that are similar to each other in topics I am interested in. And, I don't mind ads scattered in there if they have to. BUT.. I hate moving ads.. and a lot of them want to move. And I'm not on Pinterest to watch videos - I'm there for static pictures, so it is HIGHLY distracting. It makes me want to scroll past anything that LOOKS like it might move - and definitely NOT pay attention to what is in the ad. Just wanted to get that off my chest. Pinterest advertisers - stop putting moving ads in our photo streams. They are distracting in an AVOID LOOKING at that square way... which I believe, is the opposite of the advertisers intention. Got my glasses appointment done, ordered the most impact-resistant frames and lens that would work for me. They feel a lot like my current glasses - but with a titanium frame and a polycarbonate lens they ended up costing three times as much as the last pair... Why do I need impact-resistant? I downstock large boxes on lifts at the store and sometimes those boxes are not well-centered and come tipping towards me. I've bent my glasses numerous times on smaller boxes like faucets and bath fans - but also one major time bracing for impact against a vanity cabinet. The side of my frames got really bent up that day. And then it didn't help that one time I sat on the glasses on the bed either - but that was after I had them rebent into shape the first time. So it was nice to have 'bendy' glasses that could survive that.. but I was looking for a frame that maybe wouldn't be hurt by such things in the first place. Soup.. maybe cornbread, and make a dishtowel maybe that I've had the fabric laying out for a week and haven't cut or sewn it yet... finish drying and folding the laundry and then organize so that the canisters are easy to use. It's been a very full Thursday. I like this 'look in my cupboard and decide what goes together' thing I've been doing lately... its much nicer than a 'diet' and although I'm ending up eating a lot of high-fiber foods, I think there were vitamins I was missing. I've been feeling really good the past few days energy-wise. At work, I get up and go and do a bunch of things all at once like I did years ago, putting up sinks, vanities, up and down the ladder putting up faucets in the right places, getting down product in the rough section (pvc parts and faucet lines and wax rings etc)... things that the past year or so have really felt more and more taxxing and I tend to do them in little bits instead of hour long jags. I don't think it has just been the cold weather - but a bit warmer does help. If only the rain would calm down a bit. Anyway. Thinking more, too. Doing the Welsh and the Japanese - the Japanese is percolating more, and watching the Welsh television shows with more and more understanding. Crocheting the blanket - almost done... pic when done. Thinking about setting up a new weaving frame again to reproduce some pillows I saw in a 'Dan Do' episode. -- at the broth point I was looking and looking for a can of sweet green peas to do this idea up with - but I didn't have any. So, after finding a can of Purple Hull Peas, I added the cayenne pepper and coriander to cater to that flavor instead - and it all ended up really good. If I hadn't done the purple hull peas I don't think I would have went so spicy... maybe basil or oregano? Chicken broth, about 1 cup? form tablespoon amounts and drop them into the broth, stirring only slightly.. we want to cook the dumplings and keep them from sticking to the bottom of the pan, but not break them up. This tastes a lot like my Chinese Spice Cabbage - same type of spices - and I can't wait for dinner tonight at work to eat the rest of it :) The dumplings are melty bread that is so very comforting and the vegetables give it a good healthy mix of flavors and textures. This is only enough for one.. because it is an experiment recipe. But, it could easily be stretched out to make a full meal! If I was making a much larger batch I think I would use more broth and let the (fresh instead of frozen) vegetables mix and simmer out into the broth for a while before adding the dumplings as the last step, a few minutes before serving. I've had my eye on a new cooking magazine at work and bought a copy last night. I've already experimented with things 'like' the recipes that are in it, stolen from glances etc. The other night I made a version of the chickpea soup that turned out wonderful. Use a pot deep enough for soup. Cut up one onion and sauté it in butter until it begins to get soft. Turn down the heat and puree one can of cannellini beans (drained). Spoon that sticky mixture into the onions and stir, cooking it a little but not burning it. Pour in one and a half bean cans worth of chicken broth, and stir well. Add either a small handful of baby spinach or a few tablespoons of canned greens. I added a few tablespoons of mashed potato powder to thicken it up. The paprika should settle out in a few minutes. This soup was great with rye bread for dipping into it. The potato flakes gave it a 'potato soup' feel but with healthier ingredients (instead of cream and potatoes).. the turnip greens really gave it a good flavor addition to counterbalance. I have a certain Catahoula dog (definitely not a vegetarian) who enjoyed this immensely with me. This next one was supposed to be fried bananas caramelized and then put into a batter and fried... well.. I got away from myself a bit and moved too fast - but it still turned out delicious. I'll probably even do it again. Although, I'll try to move slower next time and see if it turns out 'proper'. One banana cut up into thin slices. Dip the bananas in the maple syrup and fry in the butter until they begin to caramelize. Remove the bananas onto another plate, dip each into the batter and return to the butter frying up each piece. What I did wrong : I ended up just putting all the caramelized bananas into the batter at once - where they stuck together and began to cook the batter.. and well.. I just poured the whole thing back in the pan and cooked it as pudding. I put it as a topping on some oatmeal I had made on the side, and it was amazing.